A perfect destination wedding in the realm of nature surrounded by mountains and lake at Taj Jim Corbett was one such wedding which one would dream of, where Sukanya and Ritik decided on their forever. 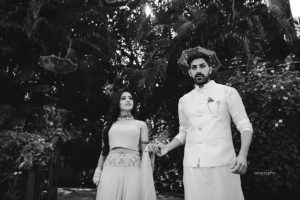 Sukanya, a typical Punjabi, bubbly and beautiful girl made a super chill bride and Ritik, all dapper, was quite a gentleman; both made a stunning couple together. The way their chemistry was blooming wouldn’t make you figure that theirs was an arranged marriage at the first instance. 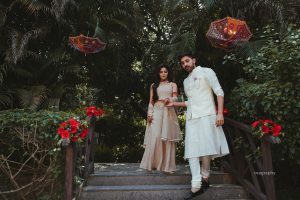 It started with a pool party which was a burst of colours with mountains in the backdrop followed by a haldi function with catchy Punjabi songs playing around and the chuda ceremony towards the end of the day. It was a great time for the families of the two to bond. For the wedding, Sukanya ditched the reds and golds and went for a rather pastel lehenga and rose gold jewelry instead where as Ritik chose an elegant white Sherwani. 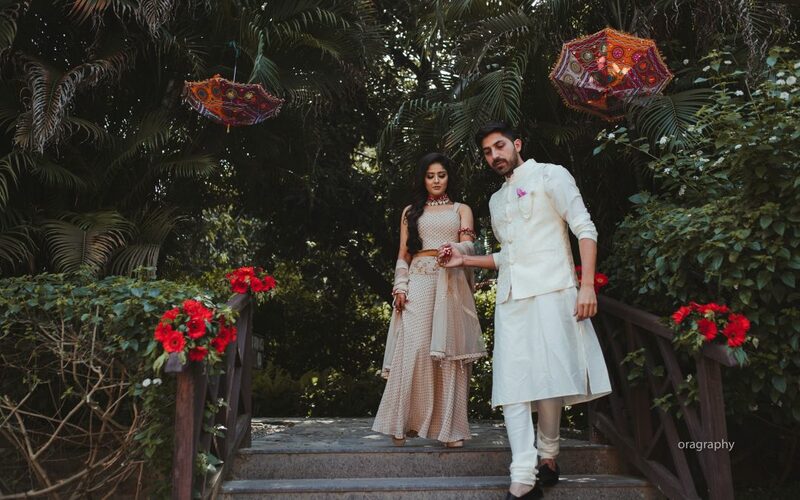 We don’t know who decided to compliment whom, but the couple definitely made a stunning vision. 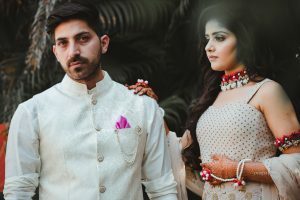 We managed to capture some gorgeous getting ready shots of the bride and the moments between the couples which was far beyond what words can explain. Sukanya walked her way to the mandap with her grandfather which was a moment worth a treasure and was handed over to Ritik half way; all the way to Varmala. It was freezing during the wedding but all the friends and family members were so invested to celebrate the two souls that little did they care. This being our second destination wedding for the season had set a very energetic and positive vibe to get a kick start. Ora cherishes the loveliness of the wedding, wishing our stunning couple a lifetime of love.